Sunset on Lake Superior. The lighthouse tower (right, foreground) makes for an ideal perch on evenings such as this. 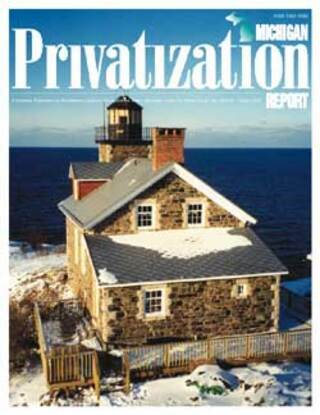 In 1996, the Mackinac Center for Public Policy published an article entitled "Would You Like to Buy a Lighthouse?" In it, Mackinac Center Senior Fellow for Economic Education Burton Folsom suggested that the federal government sell off its lighthouse properties. 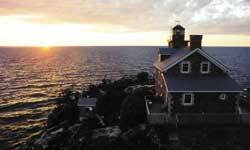 More than 100 lighthouses dot the Great Lakes coastlines of the state of Michigan. Folsom wrote that selling the lighthouses could be a win-win situation for all. Private investors would have a greater incentive to care for these historic treasures, the government would make money on the sales, and taxpayers could be relieved of subsidizing the properties, many of which are in a state of disrepair and decay. What has happened since? The short answer is, "a lot." In 1999, the U.S. Coast Guard placed a single Michigan lighthouse up for sale, presumably to test the waters for possible future sales. The Granite Island Lighthouse was sold to Freeland, Mich. entrepreneur, Scott Holman, for $86,000. Granite Island is a forbidding rock located in Lake Superior, about 10 miles north of Marquette. Its first owner was a private citizen, Henry B. Lathrup, who had it forcibly taken from him by the state of Michigan in the 1860s for purposes of transferring it to federal ownership so Washington could build a lighthouse there. After acquiring the island, Holman and his wife, French-born Martine, began planning its refurbishment. They hired a videographer, a photographer and a project manager to document the current condition of the lighthouse. The Holmans studied period lighthouses in great detail, hoping to recreate an authentic 19th-Century version. As part of their research, they visited the National Archives in Washington D.C. and asked the United States Park Service for information on the structure of original lighthouses. In addition, they studied reams of lighthouse documents, including old pictures, drawings and books. They also worked closely with the Michigan's Historical Preservation Office and with private citizens interested in lighthouse preservation. On April 27, 2000, Scott Holman made his first visit as owner of Granite Island. It wasn't the first time he had set foot there. Holman grew up in the Upper Peninsula, attended Northern Michigan University, and owned and ran a scuba diving store in Marquette from 1960 to 1965. When he lived in the area he visited Granite Island often, making his last visit 35 years ago. According to Holman, the lighthouse was in bad shape then. What would it look like in 2000? The interior of the lighthouse was a mess. Cracked roof plaster was falling from the walls, there was no glass in any of its window frames, and there was only one salvageable door. The roof that had survived the decades was made of asbestos, and would need to be replaced. A hole in the roof had managed to replicate itself down through every level of the lighthouse, all the way to the basement. The roof would eventually be replaced using shingles chosen to replicate the original look. Armed with something the government didn't have-a private owner's incentive to improve the place-Holman and his team went to work. The Holmans had to remove more than 260 bags full of fallen plaster from the lighthouse before builders could install new drywall. Since there is no dump on the small island, garbage generated by the restoration had to be hauled ashore and disposed of properly-especially in the case of asbestos shingles, which were handled by Superior Environmental of Marquette. From July through September of this year more than 500 trips were made to and from the island by three vessels carrying refuse from the lighthouse restoration. A single leg of the journey can take between 15 and 90 minutes, depending on the weather. On one such trip, the barge carrying old plaster to shore sank and Holman and company had to scuba dive to depths up to 70 feet to retrieve every bag. Thankfully, none of the heavy industrial bags spilled its contents. Another task was to haul propane, batteries and a water pump ashore to provide basic energy needs. The 96-year old derrick, which was needed to hoist supplies from boats to the island, had to be repaired. An entirely new set of 420 steps had to be built from the base of the island up to the lighthouse itself. The primary work crew lived in a large tent from Monday through Thursday, working 12-hour shifts. A portable, wall-less commode (similar to an RV chemical toilet) was hauled to the island for workers' convenience and placed on the north end of the island to ensure "picturesque views" for its users. After removing what could not be saved, workmen outfitted the island with new electrical wiring, fuse boxes, batteries (which are charged by solar panels and wind generators) and high-speed Internet access, downloaded via satellite. The next step was to install nearly 10,000 square feet of new drywall. Workers then prepped the door and window areas for brand new, custom-made windows on the outside of the lighthouse and new doors on the inside, including an exquisite set of French doors. Most of the floors were salvaged by the renovators, cleaned and refinished after the drywall had been painted and other carpentry work done. When the work of restoration was complete, the Holmans opened their property to several public uses. Its first public function was a fundraising event for a theatre group from Marquette in June, 2001. They also allowed the National Oceanic Aerospace Administration to place webcams around the island to observe ice formation on Lake Superior. The Holmans have also hosted a nonprofit corporation's board meeting and visits by two state senators and three state representatives to Granite Island since buying and refurbishing the property. In addition, the Holmans have installed equipment to record wind speeds, temperature and other weather-related data. These are fed into a computer that frequently updates the weather portion of the Holman's web site, graniteisland.com. The site's weather page is very popular among Marquette fishermen and leisure boaters. Unfortunately, rather than take Granite Island as an example of the benefits to be derived from allowing private ownership of lighthouses, state and federal leaders are back to responding to calls for lighthouse preservation in the usual way: by expanding the government's role. In 1999, the state of Michigan budgeted more than $3 million for upkeep and restoration of lighthouses through its Clean Michigan Initiative and in succeeding years appropriated $300,000 for the Michigan Lighthouse Assistance Program, which assists local groups in preserving and protecting lighthouses. In addition, Michigan's Historic Preservation Office doles out about $90,000 annually in grants for lighthouse projects. At the federal level, Sen. Carl Levin, D-Mich., introduced a bill entitled the "National Historic Lighthouse Preservation Act," which passed on Jan. 24, 2000, just months after Holman purchased Granite Island. This sweeping legislation gives non-profits the best shot at buying the facilities through a mandated process of ownership transfer. Under the Levin bill, the U.S. Coast Guard will transfer title of a lighthouse to the U.S. General Services Administration, which will then advertise a "Notice of Availability" alerting governments, other federal agencies, and interested nonprofits of an available lighthouse. With the new law in effect, private nonprofits will be able to compete for these properties without bidding against private citizens for the right to hold title. Only if no government agencies or nonprofits express interest in buying the lighthouse in question will it be offered to a private buyer. Of course, the idea behind the legislation is to keep lighthouses as part of the public domain so everyone may have access to these historic buildings. Intentionally or not, the U.S. government has opened the door-even if just a crack-to private-sector restoration of Michigan's lighthouses. But, it is counterproductive to turn around and make it harder for the Scott Holmans of the world to obtain these historic treasures. It is tantamount to saying we would rather these historic landmarks die of neglect than allow the private sector to renovate them. We seriously doubt the taxpaying citizens of Michigan would agree with such a formulation. Hopefully, policy-makers will remember that what people own they take care of, while what belongs to everyone tends to fall into disrepair. The state, as author of the problem, should reduce its role in lighthouse preservation, not increase it. To gain confidence in what can be accomplished with a little private incentive and hard work, all it needs to do is consult Scott and Martine Holman. Michael LaFaive is senior managing editor of Michigan Privatization Report.